So, you’re thinking about attending a conference. That’s great! You will put yourself in a great position to listen to dozens of leading professionals in your industry, meet new people, attend workshops, and take home some great and useful information. Attending can help you take your business and brand to the next level. Before you decide on attending, take a moment and conduct some research to make sure it’s a good fit for you. There are a lot of things that you will have to do to prepare for it, so below we’ve listed some helpful tips to make sure to do it right! First, you’ll want to look closely at the conference and determine the benefits and think about what you want to accomplish from attending. This can be challenging, but it’s an important task. Business owners often attend to network with their peers, learn new skills, discuss new products or services and possibly look into speaking opportunities. Others may want to get advice from industry experts and leaders. Make a list of objectives and try to stick to it as close as possible. But, as thing change and update, make sure you take full advantage. With hundreds of conference to attend, they continue to be great for networking, so it’s essential to have your business cards available and on-hand at all times. Before heading to a conference, allow yourself plenty of time to look over them and decide if you need to print more or possibly update the content. Ultimately, you’ll want to make sure the information is correct. This can be an ideal time to create a new design or choose a new option for your business card. Some individuals create business cards specifically for the conference. They’ll include a booth number, special promotions, or QR code on the card. Check out the large selection of custom business cards, we’ve got one that’s right for you! Look through all our option (finish, features paper stocks) that best represents you and your business. If you need help with a design, we can help with that too. Along with business cards, it’s recommended to have additional print materials to hand out. While attending, it’s easy to promote your business with printed materials. Some of those products are listed below. Business Brochures – Highlight the business, products, and services. Include images to draw peoples attention. Custom Sell Sheets – A one-page piece of paper that quickly and easily showcases the benefits of a business, product, or service. Notepads – They often consist of a business logo, information or an inspirational quote. They are handy for writing down notes and are a popular handout while attending a conference. Presentation Folders – Keep everything in one place. They hold loose papers and documents together. Options can be included to hold business cards or CDs. It’s always to have one or two of the following items as they are natural for someone to hand out effectively and display on a booth. We all know that traveling can sometimes be tedious and stressful. Fortunately, if you prepare for your trip in advance, traveling will be a lot easier. This can be done by booking your trip a few weeks before, and it may save you money by booking your hotel and flight early. Additionally, allow yourself plenty of time to get familiar with the location; this can include reviewing the traffic route to and from the conference. Most conference websites list popular restaurants, coffee shops, and activities to help you prepare and familiarize yourself with the location. Need some extra advice for travel? Take a look at some useful tips to make your business travels easier by the Travel Channel. Before attending, research the conference and the city before committing. Ask yourself: will this conference be beneficial? Why attend the conference? You can always read the reviews and if possible, try to reach out to someone who that will be attending or has attended in the past. You’ll be able to gather the valuable information you might not have known. Make sure you look at the schedule of events for each day. Determine if they will serve breakfast, lunch or provide a happy hour. Get there early so you can get a jump start on networking and possibly have a conversation with other attendees. Additionally, when looking at the schedule, determine which speakers you’ll want to hear and workshops to attend. The first objective is to be prepared. Conferences give you the opportunity to learn, so it’s important to take advantage of the presentation, speakers, and workshops. Look for a seat that’s close to the presenter and be prepared to take notes or record sessions. If taking notes, at the end of the evening, go through and organize them. This can be very helpful and is often overlooked. You’ll want to make sure they’re easy to read and understand when you return home. For more ideas, check out Effective Note Taking Skills: 4 Techniques to Use at Meetings. Having a notepad on hand is a great way of taking notes while attending a conference and they can work as hand-outs or leave-behinds to others attending. Keep up with those you’ve met or would like to continue to build a business relationship with. There are some best practices when it comes to business cards. If you received one, it’s best to reach out to them following the conference. Take a few minutes and send them an email expressing how much you enjoyed meeting them. It’s always good to follow up, as it can lead to a healthy business relationship. There are hundreds of conferences and events happening year-round. Below a few upcoming conferences, you may interest in attending. Make sure you are prepared! 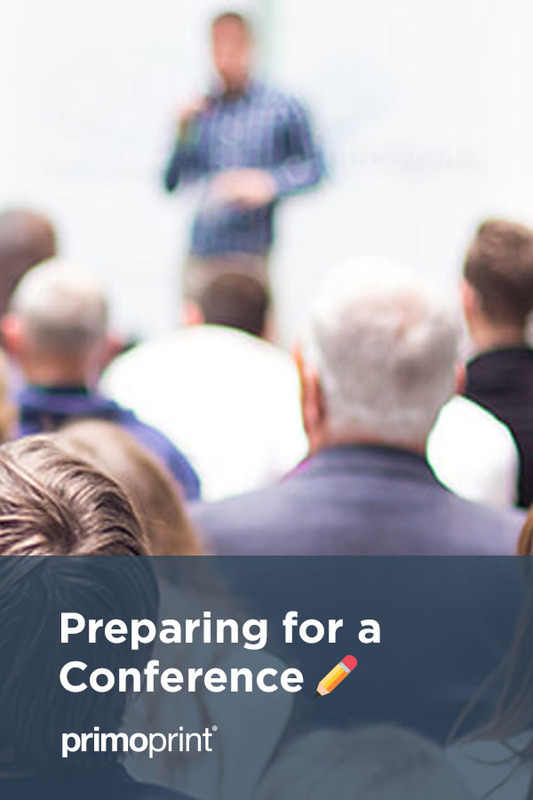 Leave a comment if you have any suggestions on how to be better prepared for your conference. If you need help with a custom design for your printed product, please contact one of our graphic designers by completing our online form.